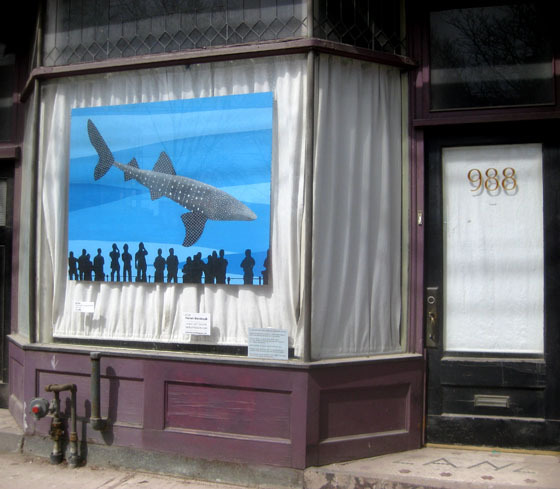 Hieram Weintraub, an artist and children’s book illustrator, has brought the Shark Fin Soup controversy to TORONTO’s West QueenWest Art Village. “LV Whale Shark”, in the front window of Studio Lighting, is accompanied by some startling info on the wholesale slaughter of the ocean’s #1 predator. This entry was posted on Tuesday, September 27th, 2011 at 11:16 am	and is filed under Art. You can follow any responses to this entry through the RSS 2.0 feed. You can leave a response, or trackback from your own site.